Coveted by empires across the centuries, straddling both Europe and Asia, Istanbul is one of the world's great metropolises. Founded around 1000 BC, the colony of Byzantium grew into the Byzantine Empire's great capital of Constantinople and after the Ottoman conquest of the city, retained its glorious place as the heart of their empire. The city (officially renamed Istanbul after the founding of the Turkish Republic) is liberally scattered with glorious remnants of its long and illustrious history, and the sightseeing here will impress even the most monument-weary visitor. As well as the big four (Aya Sofya, Topkapi Palace, Blue Mosque, and Grand Bazaar), leave enough time to explore the other sights. Although many tourist attractions are located in, or near, the old city district of Sultanahmet, there is a dazzling array of other things to do throughout the farther reaches of the city. 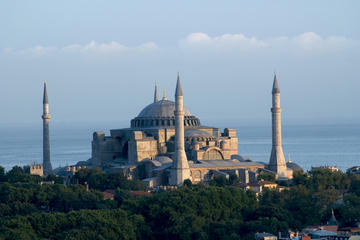 Plan your trip with our list of the top tourist attractions in Istanbul. It's said that when the Byzantine Emperor Justinian entered his finished church for the first time in AD 536, he cried out "Glory to God that I have been judged worthy of such a work. Oh Solomon, I have outdone you!" The Aya Sofya (formerly the Hagia Sophia) was the emperor's swaggering statement to the world of the wealth and technical ability of his empire. Tradition maintained that the area surrounding the emperor's throne within the church was the official center of the world. Through its conversion to a mosque, after the Ottoman armies conquered Constantinople, to its further conversion into a museum in the 20th century, the Aya Sofya has remained one of Istanbul's most cherished landmarks. First built by Mehmet the Conqueror in the 15th century, this glorious palace beside the Bosphorus was where the sultans of the Ottoman Empire ruled over their dominions up until the 19th century. The vast complex is a dazzling display of Islamic art, with opulent courtyards lined with intricate hand-painted tile-work, linking a warren of sumptuously decorated rooms, all bounded by battlemented walls and towers. Of the many highlights here, the most popular are the Harem (where the sultan's many concubines and children would spend their days); the Second Court, where you can walk through the vast Palace Kitchens and stand in awe at the dazzling interior of the Imperial Council Chamber; and the Third Court, which contained the sultan's private rooms. The Third Court also displays an impressive collection of relics of the Prophet Muhammad in the Sacred Safekeeping Room and is home to the Imperial Treasury, where you're greeted with a cache of glittering gold objects and precious gems that will make your eyes water. To fully see Topkapi Palace, you'll need at least half a day. Sultan Ahmet I's grand architectural gift to his capital was this beautiful mosque, commonly known as the Blue Mosque today. Built between 1609 and 1616, the mosque caused a furore throughout the Muslim world when it was finished, as it had six minarets (the same number as the Great Mosque of Mecca). A seventh minaret was eventually gifted to Mecca to stem the dissent. The mosque gets its nickname from its interior decoration of tens of thousands of Iznik tiles. The entire spatial and color effect of the interior makes the mosque one of the finest achievements of Ottoman architecture. A great sightseeing joy of a trip to Istanbul is wandering amid the gardens sandwiched between the Blue Mosque and the Aya Sofya to experience their dueling domes in twin glory. Come at dusk for extra ambience, as the call to prayer echoes out from the Blue Mosque's minaret. Directly behind the Blue Mosque is the Arasta Bazaar; a great place for a shopping stop as the handicraft shops here sell high-quality souvenirs. Even if you're not interested in a browse, head here to see the Great Palace Mosaic Museum, which is tucked between the Arasta Bazaar and the mosque. This small museum displays the 250-square-meter fragment of mosaic pavement that was unearthed in the 1950s here. Excellent information panels explain the mosaic floor's recovery and subsequent rescue. The Basilica Cistern is one of Istanbul's most surprising tourist attractions. This huge, palace-like underground hall, supported by 336 columns in 12 rows, once stored the imperial water supply for the Byzantine emperors. The project was begun by Constantine the Great but finished by Emperor Justinian in the 6th century. Many of the columns used in construction were recycled from earlier classical structures and feature decorative carvings. The most famous of these are the column bases known as the Medusa stones in the northwest corner with their Medusa head carvings. A visit here is very atmospheric with the columns beautifully lit and the soft, steady trickle of water all around you. The ancient Hippodrome was begun by Septimius Severus in AD 203 and completed by Constantine the Great in AD 330. This was the center of Byzantine public life and the scene of splendid games and chariot races but also factional conflicts. Today, there isn't much of the Hippodrome left to see, except for a small section of the gallery walls on the southern side, but the At Meydani (park), which now stands on the site is home to a variety of monuments. On the northwest side is a fountain, presented to the Ottoman sultan by the German Emperor William II in 1898. Then, heading southwest are three ancient monuments: a 20-meter high Egyptian obelisk (from Heliopolis); the Serpent Column brought here from Delphi by Constantine; and a stone obelisk that originally was clad in gold-covered bronze plating until they were stolen by the soldiers of the 4th Crusade in 1204. Just a hop, skip, and jump away from Topkapi Palace, this important museum complex brings together a staggering array of artifacts from Turkey and throughout the Middle East, which sweeps through the vast breadth of history of this region. There are three separate sections in the complex, each of which are worthy of a visit: the Museum of the Ancient Orient; the main Archaeology Museum; and the Tiled Pavilion of Mehmet the Conqueror, which holds a staggering collection of ceramic art. As well as all the wonderful artifacts on display, don't miss the interesting Istanbul Through the Ages exhibit room in the main Archaeology Museum. For many visitors, sightseeing in Istanbul is as much about shopping as museums and monumental attractions, and the Grand Bazaar is where everyone comes. This massive covered market is basically the world's first shopping mall, taking up a whole city quarter, surrounded by thick walls, between the Nure Osmaniye Mosque and Beyazit Mosque. The Beyazit Mosque (built in 1498-1505) itself occupies the site of Theodosius I's Forum and has architecture inspired by the Aya Sofya. Entrance to the bazaar is through one of 11 gates from where a maze of vaulted-ceiling laneways, lined by shops and stalls selling every Turkish souvenir and handicraft you could imagine, cover the area. The various trades are still mostly segregated into particular sections, which makes browsing easier. Near the bazaar's Divanyolu Caddesi entrance is the Burned Column. This stump (still 40 meters high) of a porphyry column was set up by Constantine the Great in his forum. Until 1105, it bore a bronze statue of Constantine. Sitting high on the hill above Sultanahmet district, the Süleymaniye Mosque is one of the most recognized landmarks of Istanbul. It was built for Süleyman the Magnificent by the famed Ottoman architect Sinan between 1549 and 75. The interior, dominated by its soaring 53-meter-high dome is notable for its harmonious proportions and unity of design. Outside in the tranquil garden area is an interesting Ottoman cemetery that is also home to the türbes (tombs) of the Sultan Süleyman and his wife Haseki Hürrem Sultan (known in the west as Roxelana). The Spice Bazaar is the place to get your foodie fix of lokum (Turkish delight), dried fruit, nuts, herbs, and, of course, spices. 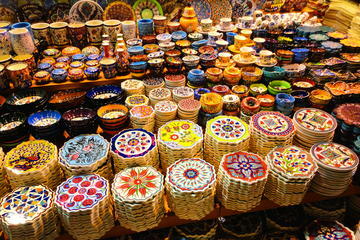 Much of the money that helped construct it came from the taxes the Ottoman government levied on Egyptian-made products, which is why its name in Turkish (Misir Çarsisi) means "Egyptian Market." The Spice Bazaar is one of the most popular things to do, and at certain times of the day gets ridiculously crowded with huge tour groups from the docked cruise ships. Try to come before 11am or after 4pm. Just next door to the Spice Bazaar's main entrance is the stately Yeni Camii (New Mosque), which was begun in 1615 and finished in 1663 — that's "new" for Istanbul. It is worthwhile taking a peek inside while you're sightseeing in the area, as the interior is richly decorated with tile-work and liberal use of gold leaf. The sumptuous and ornate Dolmabahçe Palace shows the clear influence of European decoration and architecture on the Ottoman Empire in the 19th century. Built by Sultan Abdülmecid I in 1854, it replaced Topkapi Palace as the main residence of the sultans. The formal gardens are punctuated with fountains, ornamental basins, and blooming flower beds, while inside the sheer splendor and pomp of the Turkish Renaissance style is dazzling. The interiors mix Rococo, Baroque, Neoclassical, and Ottoman elements, with mammoth crystal chandeliers, liberal use of gold, French-style furniture, and dazzling frescoed ceilings. Chora means "country" in Greek, and this beautiful Church (originally called the Church of St. Saviour of Chora) lay just outside old Constantinople's city walls. The first Chora Church was probably built here in the 5th century, but what you see now is the building's 6th reconstruction as it was destroyed completely in the 9th century and went through several facelifts from the 11th to 14th centuries. The church (now a museum) is rightly world-famous for its fabulously vibrant 14th-century mosaics, preserved almost intact in the two narthexes and fragmentarily in the nave, and the frescoes along the walls and domes. These incredible examples of Byzantine artistry cover a wide range of themes, from the genealogy of Christ to the New Testament stories. Housed in the palace of Ibrahim Pasa, who was Grand Vizier for Sultan Süleyman the Magnificent, this museum is a must-see attraction for anyone interested in Ottoman and Islamic art. The carpet collection on display here is vast and is heralded by textile experts as the world's best. This is a prime place to come have a peek at the dazzling array of styles of Turkish carpets (along with carpets from the Caucasus and Iran) across the centuries before setting out on a shopping mission to purchase your own floor piece. There are also exquisite ceramics, calligraphy, and wood carving exhibits ranging in date from the 9th century AD to the 19th century. Before Emperor Justinian built the Aya Sofya, he had to test out if the building would work structurally, so he built this miniature version first. Its original name was the Church of Sergius and Bacchus, but the obvious architectural parallels with the Aya Sofya led to its long-held nickname becoming the building's official title. During the Ottoman era, the church was converted into a mosque and it still functions as a working mosque today. Although its proportions aren't as grandiose as others in Istanbul, the building has been beautifully restored and is well worth a visit. The walk here, down narrow alleyways lined with tall Ottoman era buildings — some lavishly restored and others creaking their way into dilapidation — is a tranquil respite from central Sultanahmet. Take the time to have a glass of tea in the Little Aya Sofya's peaceful garden to sustain you for further sightseeing exploits. Possibly the most perfectly pretty mosque in Istanbul, Rüstem Pasa Mosque is home to the most stunningly preserved Iznik tile panels in the city. Sure the Blue Mosque may get all the glory, but it's here — covering both the exterior courtyard walls and the mosque interior itself — that you'll find the best examples of these gorgeously intricate hand-painted tiles in blues, reds, and greens. Even better, as it's less known, you're likely to be able to admire them up close without having to battle any crowds. Finding the mosque adds to the fun as it's squirreled down a skinny lane lined with market stalls and always bustling with life, near the Spice Bazaar. Although it's a bit of a schlep on the suburban train to get out to Yedikule, this commanding fortress is well worth it. Built in the 5th century by the Emperor Theodosius II, the fortress made up the southern section of Constantinople's defensive walls. The mammoth arch (blocked up in the late Byzantine period) was known as Porta Aurea (Golden Gate), with doors plated in gold. When the Ottomans conquered the city, they used the fortress for defense, and later as a prison and execution place. Yedikule has been restored in recent years, and you can climb up to the top of the battlements for superb views across the Sea of Marmara. This Genoese tower was built in the 14th century and is one of Istanbul's most recognizable landmarks. Take the elevator or the stairs for great panoramic views over the city from the top balcony. Be aware, though, that it's a super popular sight, so come early or be prepared to wait in line. For many people, a trip to Istanbul isn't complete without at least one trip to a carpet shop. Head here, to find out more about the incredible heritage and artistry of carpets before you purchase your own rug to bring home. Housed in one of the outer buildings of the Aya Sofya complex, the three galleries here walk you through the history of Turkish carpets and the dazzling array of motifs and styles from different regions of the country. Think of it as your Turkish carpet 101. Proving that Istanbul isn't just about historic sightseeing, this thoroughly up-to-the-minute art gallery holds an extensive collection of Turkish modern art with an ever-changing calendar of exhibitions, hosting both local and international artists throughout the year. This is by far the best place in town to get your finger on the pulse of Turkey's contemporary art scene. The galleries are being temporarily hosted in a historic Beyoglu building while they wait for the completion of this art museum's new permanent home in Karaköy. The district of Fatih is home to this important mosque built by Sultan Mehmet the Conqueror, who finally broke through Constantinople's walls, ending the Byzantine era. Built atop a hill, so its multiple domes and minarets soar above the district, it's a grandly imposing building. As the first of Istanbul's grand imperial mosques to be built, as well as being home to Sultan Mehmet's tomb, it's an important historic building and a popular pilgrimage site for locals. Istanbul's most famous art gallery is the lovely Pera Museum, which is where art-hounds head to drink in one of the finest collections of Ottoman-era painting in the world. As well as the art, make time to wander through the rest of their collection, which includes plenty of ceramics along with other Ottoman period objects. The program of regularly changing exhibitions often displays some of the art world's biggest names. Pedestrianized Istiklal Caddesi (Independence Street) is a bustling modern shopping street with a wealth of restaurants and cafés. The lower end of the street can be reached by taking the world's oldest underground railway from near Galata Bridge, the Tünel, constructed in 1875. There is also a quaintly old-fashioned tramway that runs along its length right up to Taksim Square at the top of the hill. From Taksim Square, busy Cumhuriyet Caddesi is lined with hotels, shops, restaurants, and high rises. On the east side of the road, just after the square, is Maçka Park, which is home to the interesting Military Museum. The area around Istiklal Caddesi is home to many churches and old consulate buildings with ornate facades. Also nearby is Orhan Pamuk's Museum of Innocence. Pamuk is Turkey's most famous author and the winner of the Nobel Prize for Literature. This conceptual-art museum is based around the theme of his novel The Museum of Innocence and is a rather bizarre, kooky, and wonderfully atmospheric experience. Istanbul's Asian shore is easily reached by ferry from Eminönü dock across the Bosphorus. On an islet just off the Asiatic shore stands the 30-meter-high Kiz Kulesi, (Maiden's Tower). Üsküdar was traditionally known as Scutari and has some handsome old mosques, winding lanes, and weathered brown timber houses (particularly between the ferry dock and the large cemetery). The town, known in antiquity as Chrysopolis, was one of the earliest Greek settlements on the Bosporus. It was much more exposed to attack by foreign conquerors than Constantinople, with its defensive situation and strong walls, but it was able to draw economic advantage from its exposed situation — until 1800 it was the terminus of the caravan routes that brought the treasures of the East to Constantinople and onwards to Europe. Of particular sightseeing interest here is the Mihrimah Sultan Mosque, built by Süleyman the Magnificent in 1547 for his daughter Mihrimah, and the Yeni Valide Mosque, built in the 18th century by Sultan Ahmet III. If you're planning to see Istanbul's top tourist attractions, the easiest place to base yourself is Sultanahmet, Istanbul's Old City, which is a short stroll from all the city's major historical attractions. The Blue Mosque, Topkapi Palace, and the Aya Sofya are all within a five-minute walk, and many hotels in the area have stellar views of these buildings, as well as out to the Bosphorus from their rooftop terraces. A tram line runs through Sultanahmet, and public transport is plentiful, connecting the district with other tourist attractions farther afield. Luxury Hotels: In a century-old Neoclassical Turkish building, the sunny-hued Four Seasons Hotel Istanbul at Sultanahmet is a mere five-minute stroll from the Blue Mosque, Topkapi Palace, and the Hagia Sophia. Decorated in Ottoman style, the boutique White House Hotel Istanbul also lies minutes from these major historical attractions. For those who prefer to stay near all the entertainment action in Taksim, the Grand Hyatt Istanbul is a great choice only a few minutes' walk from Taksim Square. Mid-Range Hotels: The elegant colonial-style Orient Express Hotel is an excellent mid-range option within walking distance of the Sultanahmet historical attractions and Sirkeci train station. Also in a prime Sultanahmet location is the Osmanhan Hotel, with beautiful views of the Bosphorus. In the heart of Taksim, the Mercure Istanbul Taksim offers contemporary comfort close to Taksim Square and Istiklal Street, one of the city's most famous walking streets, lined with cafes, boutiques, and bookstores. Budget Hotels: If you're traveling on a budget, the Hotel Alp is a small boutique hotel offering great value for money in the heart of Sultanahmet and is full of old-fashioned charm. Minutes from the Blue Mosque, the Hotel Peninsula and charmingly-named Apricot Hotel are other popular budget hotels in convenient locations close to all the historical sites. Explore the City: If you have only a day or two set aside for sightseeing, take the Istanbul in One Day Sightseeing Tour. This walking tour will ensure you see the most important attractions, including the Topkapi Palace, Hagia Sophia, the Blue Mosque, and the Grand Bazaar, as well as others. This is a small group tour, limited to 14 people, and includes hotel pickup and drop-off, a traditional lunch, and admission to the sites. If you have more time in the city, or if you are interested in touring the sites independently, take the Istanbul Big Bus Hop-On Hop-Off Tour. This is a traditional double-decker bus, which stops at the major sites and allows you to tour the city at your own pace. It's also a great way to get familiar with the general layout of the city. Tickets are valid for either 24 or 48 hours. Experience Traditional Culture: If you have time for a show, seeing a whirling dervishes performance is a must. This experience has the unique designation of being a UNESCO-listed ceremonial dance. Buy advance tickets for the Whirling Dervish Show, held at the famous Hodjapasha Dance Theater. Take a Day Trip: One of the most popular day trips from Istanbul is an outing to the WWI Battlefields of Gallipoli. The full day Gallipoli Day Trip from Istanbul includes hotel pickup and drop-off, entrance fee, lunch, and a professional guide. Gallipoli was the scene of intense battles during WWI between Ottoman Turks and the Australian and New Zealand forces. Head Out to Sea: For a wonderful, leisurely afternoon outing on the water, take a Bosphorus Strait and Black Sea Cruise from Istanbul. This 5.5-hour cruise comes complete with lunch, a guide, and hotel pickup and drop-off. Guests will enjoy some tasty Turkish specialties on the boat before heading out on the Bosphorus Strait to explore ancient ruins and soak up the sun, scenery, and sites. The Coast and More Historic Cities: After an Istanbul sojourn, why not hit Turkey's famed coastline, lapped by the waves of the Aegean and Mediterranean seas. Check out our articles on Bergama and the North Aegean, Fethiye, Antalya, and Kas for inspiration. Turkey has plenty of other historic cities to discover. Konya and Sanliurfa are two of the best and are city guides to these destinations can help you plan your time.